When you make the decision to grow marijuana indoors there are a few things that you must consider. Assuming that your seeds are already sprouted here are some important guidelines for keeping your plant healthy during the vegetative and flowering stages and ensuring that you have a bountiful harvest. Before you invest a lot of time and money into growing marijuana plants you should ensure that you choose top quality cannabis seeds to start your indoor growing operation. After all, the end result of your growing operation will depend a lot on the seeds you plant. Things like genetics, authenticity, shipping and storage conditions, and many other factors are important to the quality of a cannabis seed and, in turn, the outcome and output of your growing operation. For this reason, it's critical that you always do your research, and never use seeds from a source that is untrusted or you know little about. Instead source seeds for your indoor growing operation from a local medical marijuana dispensary. Alternatively, if no trusted local cannabis seed supplier can be located, buy seeds from a reputable online seed bank that has been around and earned a reputation for having quality weed seeds. Seeing the results of your labor will no doubt give you a sense of pride. You might be tempted to share your success with the world but you must not! Only the people in your home should know of your plans and if there is someone there that you cannot fully trust don’t pot weed plants indoors. Giving people the license to share your information by telling them your plans can have detrimental results so keep your mouth shut. Your crop will be vulnerable to pests and diseases so you must keep everything clean. Wash your hands thoroughly before handling cannabis plants and make sure that you keep your tools clean to maintain the pest and disease free environment that your marijuana plants need. Your plants need quality soil in order to flourish. Start with good quality soil and add the essential mix of nutrients that the plant requires (Nitrogen, Phosphorus, and Potassium, most plant foods have a nice 20-20-20 mix and will work well) making sure to maintain a pH of 6.5 which is ideal for the marijuana plant. Plants need water but adding too much water will kill your young plants. Check the soil for moisture by sticking your fingers at least 5 inches deep and if you do not detect moisture you can water the plants. Tap water should be allowed to sit for 24 hours before adding to the plants to allow for the removal of harmful sediments. 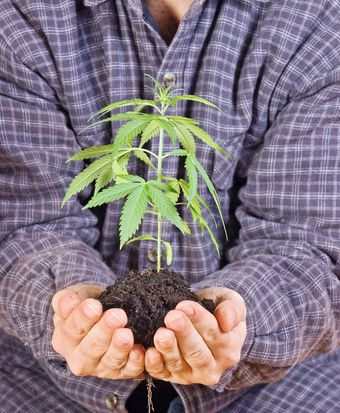 Many inexperienced marijuana growers make the common mistake of adding too much fertilizer to the plant. Add only the nutrients that your plant needs and add these nutrients only when the plant is in need of them. During the vegetative stage of the growing cycle you will need to add more Nitrogen whereas Phosphates are more important in the flowering stage. Grow room lighting, temperature, humidity and the overall care that you give to your marijuana plants will determine the outcome of indoor growing operations. Keep these variables constant in order to give the cannabis plants the very best environment that they need to flourish. Yes, I know you can’t wait to enjoy the fruits of your labor but if you’re patient you will enjoy even more fruits! You’ll know that it is time to harvest when the pistils change from white to brown or orange. After you’ve harvested you can put the plants to dry and enjoy your crop of indoor grown marijuana.